Blondes may not always have more fun, but why chance it when becoming a gorgeous blonde is as easy as putting on this wig? The look seems to work for Alice, Goldilocks and plenty of other famous girls. If you thought Goldilocks was hard to please before, then you'd better watch out for her now. This time her diva antics are completely out of control. Goldilocks now demands that you dress your bed in Egyptian cotton sheets. She also requests the most expensive brand of oatmeal. Goldilocks can do that though, because she's pretty and has an epic gold cape! 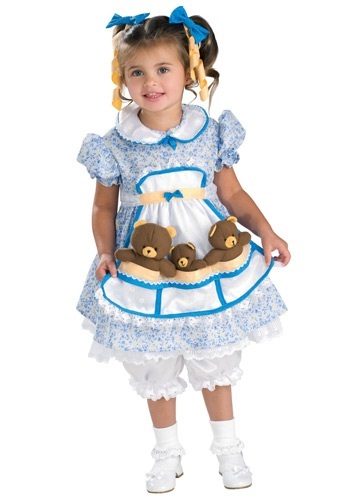 Show that you're ready to bring a classic back into being au courant with this costume. Goldilocks is ready to get rid of the old fairytale image after all, and these are the 2010s; so a peasant girl just isn't going to cut it in the modern age. 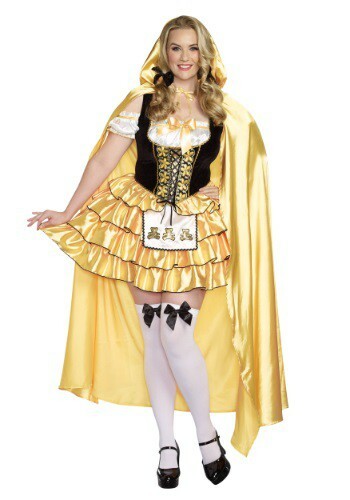 Fortunately you'll look timeless with this classically styled plus size costume. Just make sure you have long locks of blonde hair (a wig will suffice), and with your wit and charm, that porridge will be yours for the taking. Actually we're guessing they'll be lining up to fill your bowl... which will be a nice change of pace!